The Greek pantheon contained many deities connected to water and the sea, although today most people only know of Poseidon, the Olympian era god. Poseidon though, was a relatively late addition to the pantheon, and he was predated by the likes of Nereus. 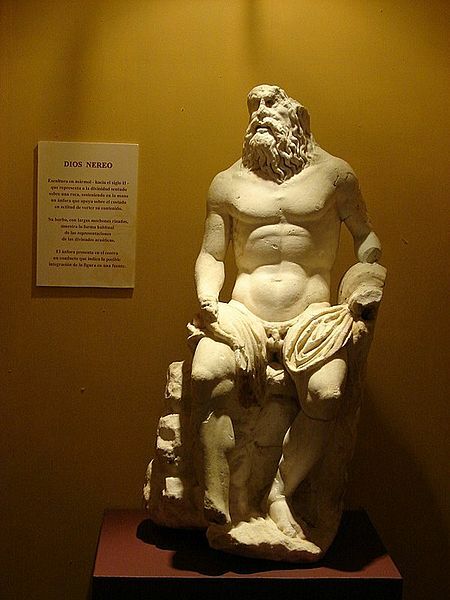 The phrase "Old Man of the Sea" is one closely associated with the works of Ernest Hemingway, but Nereus was the original Old Man of the Sea. In Greek mythology, Nereus was one of the most virtuous of all the Greek gods and goddesses, and he was almost universally agreed to be wise, gentle and truthful; an additional ability of Nereus was his ability to see into the future. In terms of appearance, Nereus is normally depicted as an old man, with seaweed for hair, and a fish-like tail instead of legs. Despite being the original Old Man of the Sea, Nereus himself was not the first sea god, for he was a contemporary of the Titans and Oceanus, and Nereus' father was Pontus. Pontus was the primordial Protogenoi god of the sea, and when he mated with Gaia, Mother Earth, Nereus was born. Nereus would marry Doris, one of the Oceanid nymphs, daughters of Oceanus. Doris would then give birth to 50 daughters for Nereus, the Nereids. Nereus was himself considered to be the sea god most closely associated with the Aegean Sea, and initially his daughters were predominantly found in this sea. With the rise of Poseidon though, the role of Nereus was marginalised, for Poseidon was considered god of the Mediterranean, and the Nereids became part of the retinue of Poseidon. During this period the most famous Nereids were Amphitrite, who would become wife of Poseidon, and Thetis, who would become mother of Achilles by Peleus. Nereus is probably today only recognised as a figure that makes an appearance within the adventures of Heracles. Heracles was in search of the garden of the Hesperides, as the garden of the Hesperides was home to the golden apples. As such, Heracles went to Nereus in order that he might receive a truthful answer about the location of the garden. Nereus though decided that he shouldn’t help the demi-god. Heracles was not so easily put off, and the Greek hero would eventually catch hold of Nereus, and held firm as the sea god changed shapes in order to try and escape the wrestling grip. Finding that Heracles would not release his grip, Nereus relented, and gave the directions that Heracles desired. Nereus was worshiped in Ancient Greece as the provider of abundant fish for the Greek fishermen to catch.